Look at these colors together. The opuntia on the left is one of my favorites. It will bloom in the spring (pink), and also setting flowers in the spring will be the elegant Dyckia (red orange), and the Palo Verde 'Desert Museum' (yellow) in the background. Here's another very statuesque opuntia (different variety of course) below. This opuntia can be found (native) at Torrey Pines Preserve. Love the single tree-like shaped opuntia with the small pond beneath. Water for the wild critters and birds of Torrey Pines. Very sweet. I really love hiking through this park...the desert and the ocean, that's where we live. It's just sick it's so beautiful here. 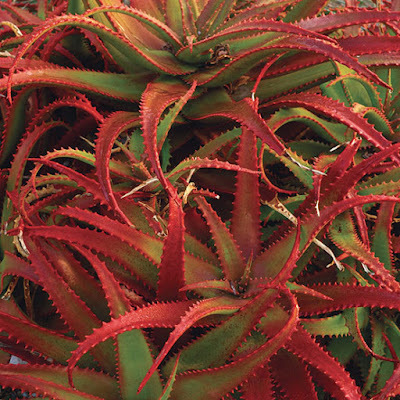 A must have for any rock garden - the Aloe cameronii. 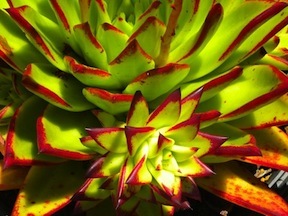 First, let it grow to the size you want it to be, and then intentionally reduce the water.